When you stay at Dar Tanja in Tangier, you'll be next to a golf course and close to Church of Saint Andrew and Place de la Kasbah. This 4-star guesthouse is within close proximity of Stade de Marchan and Grand Socco Tangier.Rooms Make yourself at home in one of the 9 air-conditioned rooms featuring flat-screen televisions. Complimentary wireless Internet access keeps you connected, and satellite programming is available for your entertainment. Bathrooms have bathtubs or showers and complimentary toiletries. Conveniences include safes and complimentary bottled water, and housekeeping is provided daily. Enjoy a range of recreational amenities, including an outdoor pool, a steam room, and a 24-hour fitness center. This guesthouse also features complimentary wireless Internet access, concierge services, and shopping on site.Dining Satisfy your appetite at the guesthouse's restaurant, which serves lunch and dinner, or grab a snack at a coffee shop/café. Quench your thirst with your favorite drink at a bar/lounge.Business, Other Amenities Featured amenities include complimentary newspapers in the lobby, luggage storage, and a library. A shuttle from the hotel to the airport is complimentary (available 24 hours). This hotel is housed within a modern building. Featured amenities include a business center, express check-in, and dry cleaning/laundry services. A roundtrip airport shuttle is provided for a surcharge (available 24 hours), and free valet parking is available onsite. 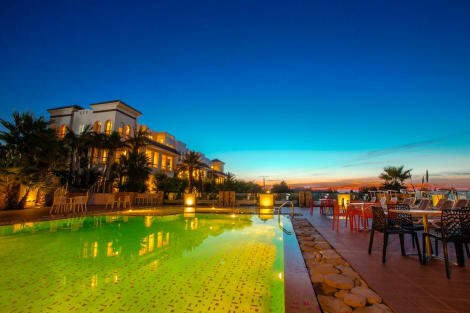 When you stay at Movenpick Hotel & Casino Malabata Tanger in Tangier, you'll be on the beach, a 4-minute drive from Tangier Beach and 9 minutes from Port of Tangier. This 4-star hotel is 1.8 mi (2.9 km) from Tangier City Mall and 3.1 mi (5 km) from Old American Legation Museum.